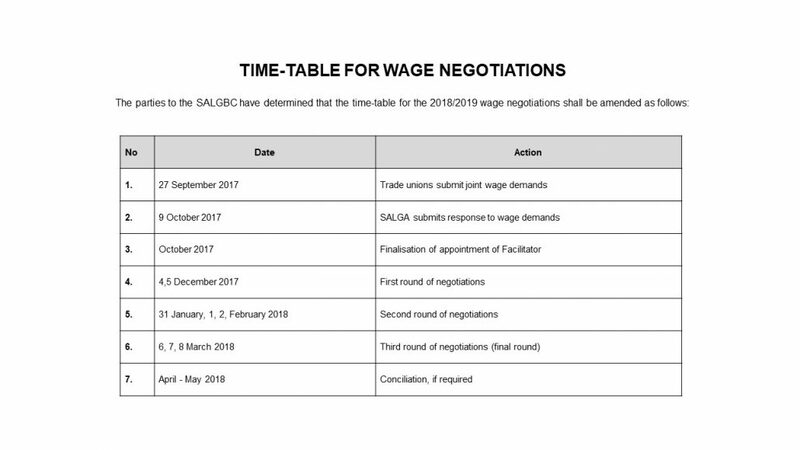 The Independent Municipal and Allied Trade Union (IMATU) filed a joint trade union wage demand with the South African Local Government Bargaining Council (SALGBC) yesterday, for 2018. IMATU’s opening demands are an across the board salary increase of 15% or R3 155, whichever is the greater, a minimum wage increase of R10 000 per month and a housing allowance of R2 000 per month. “We believe that our demands are a good starting point from which to open the negotiations. We have taken account of the rising cost of living, economic conditions of the country and the impact thereof on the disposable income of our members. We have also analysed the financial position of municipalities and we believe that we can provide clear motivations and make a business case for our demands,” explained General Secretary, Johan Koen. At present, workers are battling high prices and high debt levels. The cost of basic necessities is constantly increasing and disposable income is decreasing. IMATU is responsible for securing wage increases that afford our members the basics for quality of life, adequate safe shelter, food, utilities, transport, health care, some recreation, education for themselves and their children, childcare and saving for retirement, as well as a wage which allows them to be free of onerous debt. IMATU has taken a firm decision to ditch positional bargaining in favour of a more interest based approach, which is less adversarial and more focused on finding solutions. This has resulted in a more productive relationship between the negotiating parties and we want to keep it that way. “Negotiations are expected to be difficult and will in all likelihood require a great deal of skill, resilience and resolve. 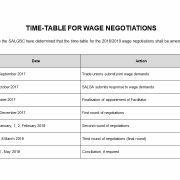 We however, have every confidence that our negotiators will be able to rise to the challenge and arrive at a beneficial settlement in the interest of our members and the sector as a whole,” stated Koen. IMATU has never shied away from putting productivity and service delivery improvement on the table and we will continue to deal with these issues as long as it does not lead to job losses. “This is in line with what Andrew Levy calls the ‘self-funding wage increase’. We concluded a Service Charter with SALGA last year that set the parameters for improving service delivery. IMATU has gone to great lengths to instil a strong work ethic in our members and emphasise the value of their work, which directly improves the lives of the citizens of South Africa,” he explained. 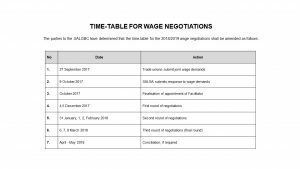 The parties have agreed on an accelerated time-table for negotiations and the first round is scheduled for 4-5 December 2017, under the guidance of facilitator Moe Ally.